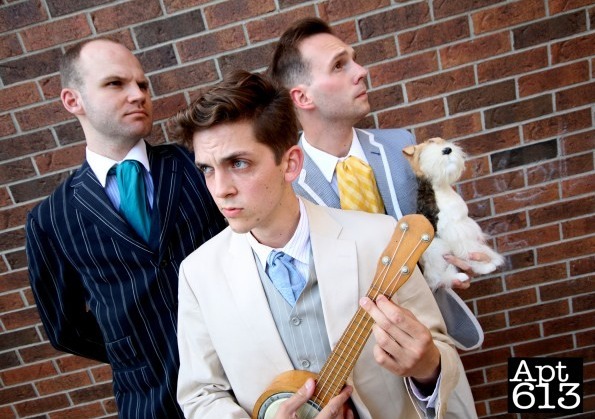 Three Men in a Boat is one of 56 shows at the upcoming Ottawa Fringe Festival and the hilarious tale of a boating adventure (gone horribly wrong —in many ways — to the delight of audiences). It was originally planned as a travel guide turned novel in 1889. Apt613 met up with the cast of four (including the fox terrier, Montmorency) who reveal that while there is no (real) boat in this tale, it’s inspired by one of the funniest books in English literature and includes an epic ‘apocalyptic’ pineapple scene that fringe-fans shouldn’t miss. Apt613: What’s the story about? “It’s the universal camping story,” explains Victor Pokinko, who has roots in Ottawa and plays the character George. “It’s a British play but it’s probably the most Canadian story there could be. You go out, you go camping with your friends, you share a few drinks, you get lost, you get rained out and you have to decide what you want to do next. Whether you want to keep going. All those things happen [disastrous packing; disorientation; bribery; a terrible run-in with a tin of pineapple; sleeping under the same stuffy and gross canvas tent; hints of mystery and superstition — plus the boat flips]. Apt613: What’s your favourite part? “The pineapple sequence,” all three men reply, smiling in agreement. “What’s fun about it is that it’s a very physical piece,” says Matt Pilipiak who originates from a hamlet outside of Saskatoon, SK, and plays the character Jay [Jerome]. “I think in a lot of ways it brings out the story-telling aspect of theatre,” adds Pokinko. Apt613: Who won’t like the play? “Any British people might find it a bit cheeky that these three Canadian boys are attempting to adapt and perform this cult-following [classic],” says Pilipiak. “It’s definitely cheeky,” adds Pokinko. “They have their own enjoyment of it though,” says the quieter Scott Garland who grew up in Cold Lake, AB, and plays Harris. The cast reveals that this is their third iteration of the production, which debuted at Toronto’s Fringe Festival last year and also brought the group to Mumbai, India, in November 2014. “In India, our last show was 1,000 seats [that sold out]. We had to turn 200 people away,” Pokinko recalls. This year’s festival in Ottawa is the beginning of their six-week tour. Apt613: Fringe, as a definition, is sometimes elusive. What does fringe mean to you? “[Fringe] offers a taste of everything and sometimes you get to see something that’s so spectacular and works so well and that’s so inspiring,” adds Pilipiak. “For me, it’s equal opportunity arts,” says Garland. Three Men in a Boat, produced by Pea Green Theatre Group in Toronto, is made possible by three cast members as well as a playwright, director, stage manager, costume designer and music director. Three Men in a Boat opens on Friday June 19, 2015 at 11:00 pm. Six performances are scheduled at the Studio Léonard-Beaulne (135 Séraphin-Marion). Tickets are $12 and are available online. The show runs approximately 60 minutes. *** Apt613 will be at all 56 Ottawa Fringe Festival plays. We aim to post our reviews within 24 hours of the opening night performances.